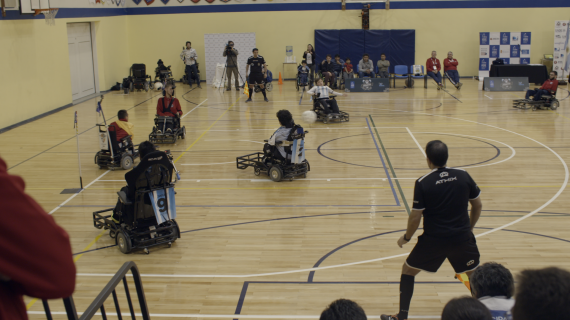 Powerchair football is soccer for people in motorized wheelchairs.The Argentine team trains only once a month due to costly and difficult logistics. Training requires a large space with a smooth floor, and the athletes have to bring their sport chair as well as their everyday chair. We created VR Power Trainer, a virtual reality platform that empowers players to train anywhere.Using human-centered design and input from the players, we built a virtual gymnasium where they can practice anytime.